This time of year always messes with my mind. On one hand, it’s 90 degrees out, ice cream must be eaten at rapid speed to keep it from becoming soup and letting the girls run through play fountains with their clothes on is the only logical way to let the cool off. (That may or may not have happened yesterday afternoon). Still, on the other hand, the calendar says September, most kids are back in school and college football kickoff is tonight. TONIGHT. So…. fall…right? See, totally messes with me. Today though, I’m focusing only on the fall half of the equation because football to me equals delicious, comforting food. 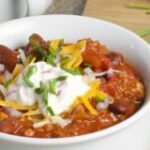 So to celebrate Georgia Tech’s (David’s alma mater) first game of the season against the mighty Alcorn State, we will be dining on chili. But not just any chili, David’s famous chili. This is not something that we just made up. Nope, David has been making this chili for years, dare I say even during the dark times of BB? (before Brittany). 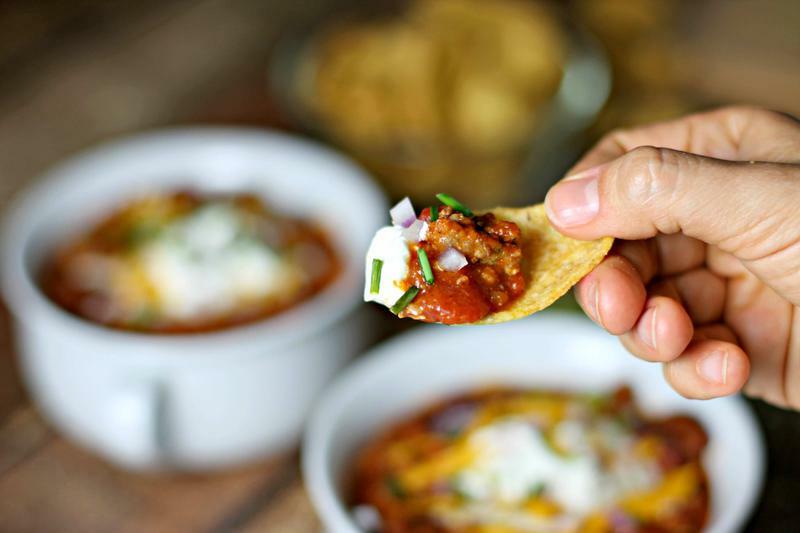 It’s everything chili should be- hearty, savory with a kick of heat and perfect for loading up all your topping favorites. Once it’s all in the pot, it can simmer away all day long, only enhancing the flavor and making the house smell incredible. For those like me who like to prep ahead, it’s a perfect meal to make ahead and freeze for convenience too. In fact, mine is going from freezer to sous vide bath for tonight’s kick off. Then I’ll be topping it with my favs- sour cream, diced red onion, cheese and chives- and maybe a splash of hot sauce for good measure. 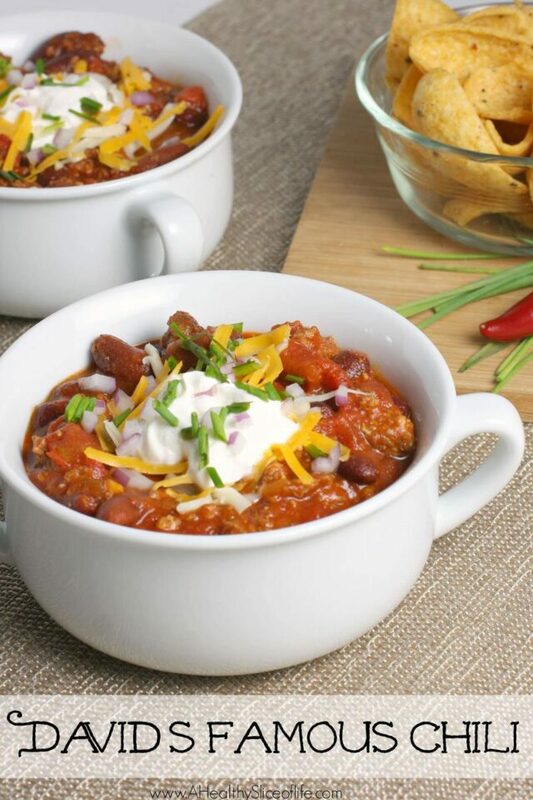 Find similar white handled chili/soup bowls here. 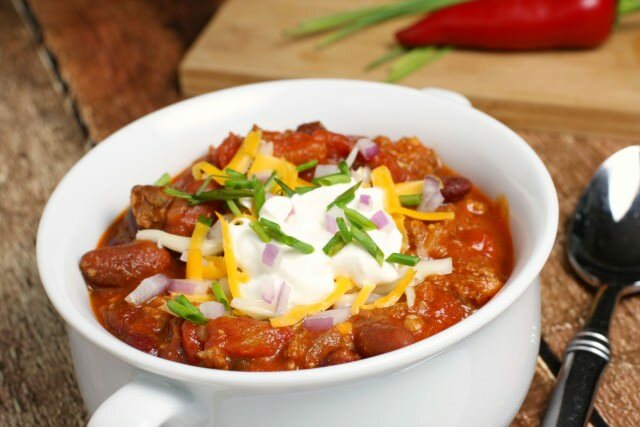 I know there are a million and one chili recipes out there, but if you’re looking for a hearty, crowd-pleasing, classic flavor-packed chili, give this one a try! After all, I already did the hard work of making David focus and write down all his measurements instead of just throwing things haphazardly into the pot. The beauty of chili though is you can certainly adjust it to your liking- more peppers for heat, more tomato sauce for a soupier consistency. Keep it as is or make it your own! 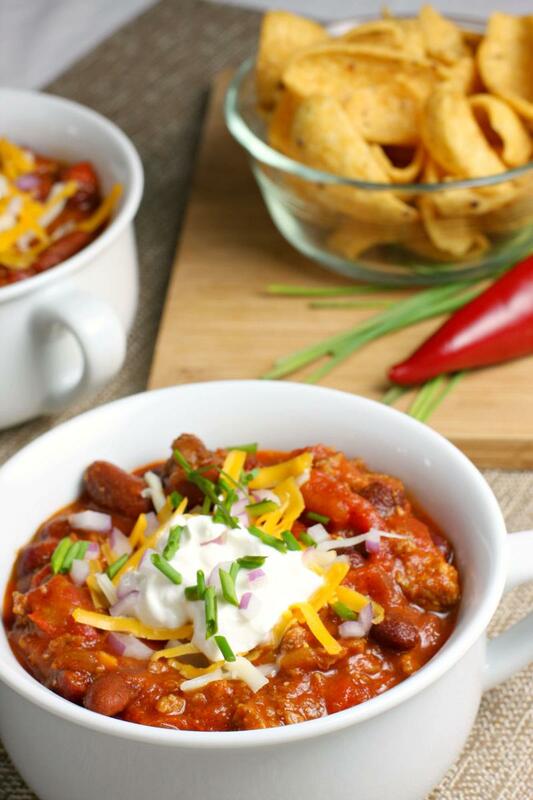 This hearty, classic chili with a slight kick of heat is the perfect food for fall. In a large skillet, cook ground beef and sausage until browned. Drain and set aside. In a large Dutch oven or soup pot, heat oil over medium heat. Add onion, garlic and peppers. Saute until tender, about 3-5 minutes. To large pot, add the drained and rinsed beans, Rotel, diced tomatoes, 1 can of tomato paste, bay leaves, chili powder and cumin. Mix thoroughly. Add drained meat and mix again. Bring to a boil, then reduce to a simmer and cover. Let simmer for a minimum of 1-1/2 hours. For added thickness, add additional can of tomato paste. I dig a lot of toppings, but I really need sour cream. The contrast of cool and creamy against warm and spicy just hits the spot! What food just screams FALL to you? For me, it’s chili, pumpkin bread and spiced nuts. My mom’s chili will forever be my favorite, but I love trying new recipes. Chili is something I will enjoy year along, but the cooler weather just begs for it. Also, yay for football season! 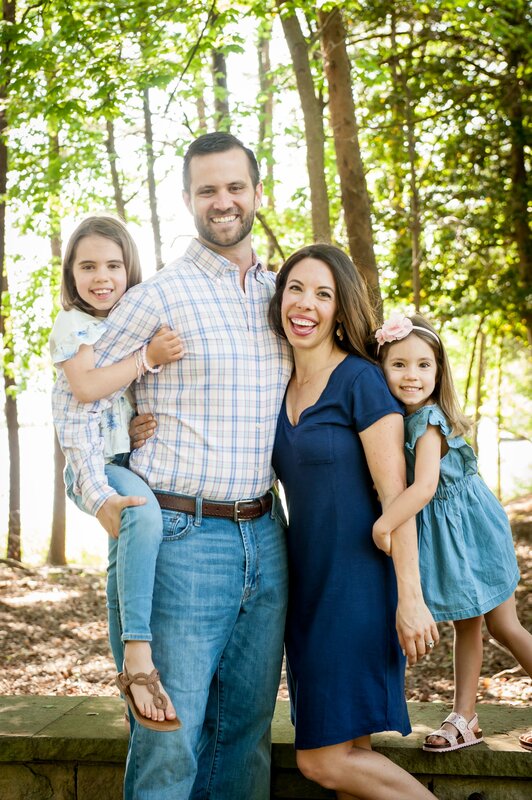 Enjoy the chili and Georgia Tech’s win. I’ll be cheering for them as I know David will be cheering for the Georgia Dawgs on Saturday! John J. recently posted..21 Habits Of Happy People! Are These Yours? As for toppings, for sure sour cream, everything else is optional. This sounds yummy and like it makes a ton!! My favorite topping on chili is diced white onions. I also love cilantro and lime on it, too. This looks like awesome chili! Chili is my favorite part of fall. Like you, Pumpkin also screams Fall, which is why I’m holding off making anything with it… I’m hanging onto summer for as long as possible. Ha ha. This looks SO good. I haven’t had chili in so long and this needs to be made soon! I don’t have a favorite chili topping but I have a favorite chili sidekick. I LOVE making cheese biscuits to have with my chili! It’s a necessity. Yummm I wanna make this! The last chili I made was vegetarian so def not as good as this sounds! tiff @ love, sweat, & beers recently posted..Almost Two! I have this chili simmering on my stove right now. Can’t wait for dinner. Thanks! Hi ? What size cans are you using od diced tomato and tomato sauce ? Sorry for the delayed response! 14.5 ox cans. I’ll go edit the recipe now! Rotel is a canned diced tomato with green chilies. You can sub can of diced tomatoes along with a can of green chilis if you’d prefer!